While I can’t say I’ve stayed at every hotel in Leavenworth, I can say that based on my experience the best hotel in the town is the Enzian Inn. If you are looking for something that screams Bavaria (which is exactly what the Central Washington town of Leavenworth is all about) then the Enzian Inn is perfect for you. The family owned and operated hotel is close to downtown, clean and full of character. Much like the entire city of Leavenworth, the Enzian Inn is Bavarian themed, and the Bavarian theme doesn’t stop on the outside of the hotel. All of the employees are dressed in Bavarian fashion, while the rooms are also decorated in the same style. 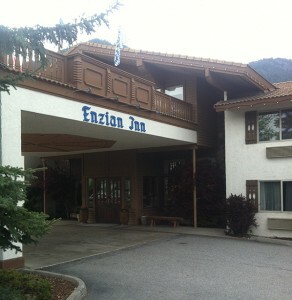 Besides feeling like you are in the heart of Germany, there are a few other benefits to staying at the Enzian Inn. 1) Free breakfast- I know many hotels offer a free breakfast in the morning, so this doesn’t sound like something special. Let me tell you differently– the [FREE] breakfast at the Enzian Inn is special. We’re talking fresh, made to order omelets, egg frittata, several different types of breakfast meats including bacon and sausage, fruit (and lots off it), pancakes, waffles and so many hand-made Bavarian pastries that you’re mind will be blown. The breakfast room is on the fourth floor of the building and has these huge, massive windows. You overlook all the neighboring mountains and downtown Leavenworth. It is a great way to start the day. 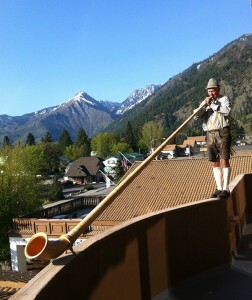 The founder of the Enzian Inn playing the alpenhorn. 2) Alpenhorn- As I mentioned, the Enzian Inn is family owned and operated hotel. Each morning, the founder of the inn (decked out in lederhosen) visits the dining room where guests are eating breakfast and he plays a traditional tune on the alpenhorn. He starts off on the deck of the dinning room, and plays overlooking downtown Leavenworth. Then, he moves into the dinning room and plays a second song. He actually does this two different times in the morning, so you have plenty of time to check it out. I had never seen or heard an alpenhorn in real life before, so this was one of my favorite parts of staying at the Enzian Inn. 3) Free skiing- During the winter months, Leavenworth turns into a snowy, white wonderland. The hotel offers free cross country skiing gear to guests, so they can enjoy the dozens of trails nearby. This includes complementary use of Nordic skis, boots and poles (NOTE: this is only available during the winter months). The Enzian Inn offers a free round of golf to all guests. 4) Free golf- When the weather is a little bit nicer, the hotel offers a free round of mini-golf to guests. 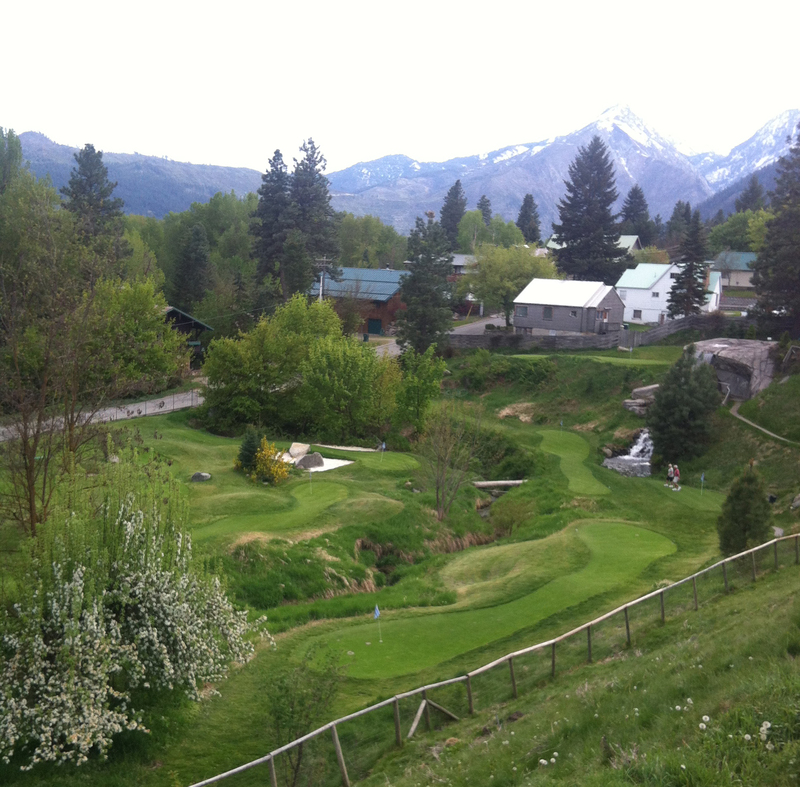 The mini-golf course is located right across the street from the Enzian Inn so it is extremely convenient. How cool is this? 5) Indoor sports- If you aren’t into golfing or skiing, the Enzian Inn offers many indoor recreational amenities, including indoor and outdoor pools and hot tubs, table tennis, a racquetball / basketball / wally-ball court, and a fitness room. 6) Evening music (and cookies! )- Every night a pianist serenades the hotel guests in the lobby. This is a great way to unwind from the day. The best part? There are free cookies to enjoy while you’re listening to the music. It is also important to mention that the Enzian Inn staff is incredible. They are extremely friendly and welcoming. When it is all said and done, I think you get a a lot for what you pay for at the Enzian Inn and I would stay there again in a heartbeat. We’ve even made it easy for you to book your room at the Enzian Inn in Leavenworth on Trip Advisor — click here. Have you ever stayed at the Enzian Inn in Leavenworth What did you think? We’d love to hear from you. Leave a comment below or connect with us on Twitter, Facebook and Google+. 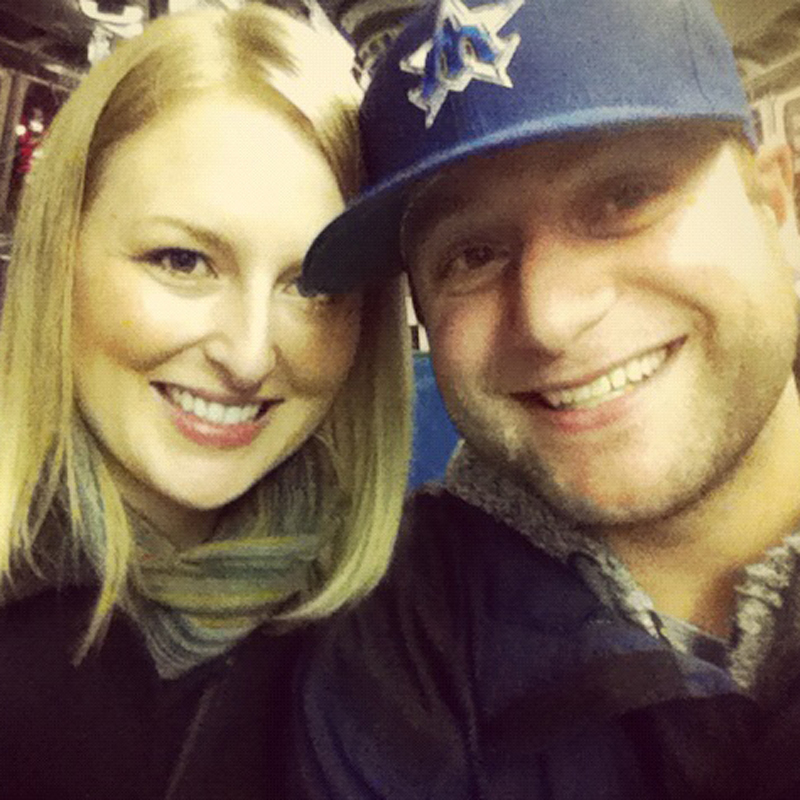 Don’t forget to also check out Seattle Bloggers for more on great weekend getaways.